Paducah is one of Kentucky's classic old river towns. Mark Twain wrote about it in several of his books. It has a population of 25,000 and boasts 20 blocks on the National Historic Registry (above left). 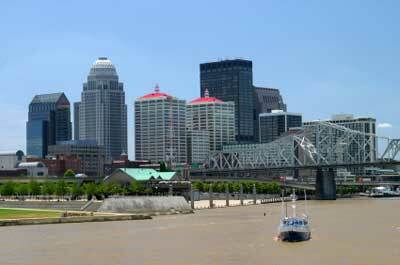 Even before the coming of the white man, it was a key location because it sits where the Tennessee River empties into the Ohio. The site was originally the location of the Chickasaw capital, and is named for their Chief Paducah. Lewis and Clark spent a night here on their way West. It was Clark who later returned with a charter and laid out the city. Paducah was a major stop for settlers bringing flatboats and keelboats down the Ohio en route to St. Louis and the Oregon Trail. 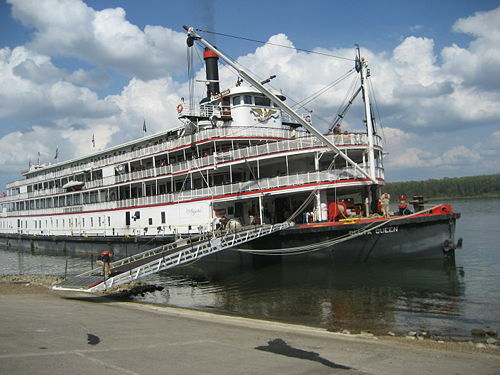 During the golden era of the big paddlewheel steamers, it boasted one of the largest shipbuilding, maintence and repair drydocks on the Ohio River (surpassed only by Pittsburgh). Later it became a major servicing center for the Illinois Central Railroad, which ran between Chicago and New Orleans. In 1950 the federal government located its Uranium Enrichment Plant at Paducah and boosters began calling it The Atomic City. Paducah has a long history of floods. Today it's the cultural capital of Kentucky's Jackson Purchase (Andrew Jackson purchased it from the Chickasaw), extreme Southern Illinois, and of course the Lakes Region. Paducah boasts a long tradition of good restaurants, blending New Orleans, Memphis, Kentucky, Southern, and Midwestern influences. 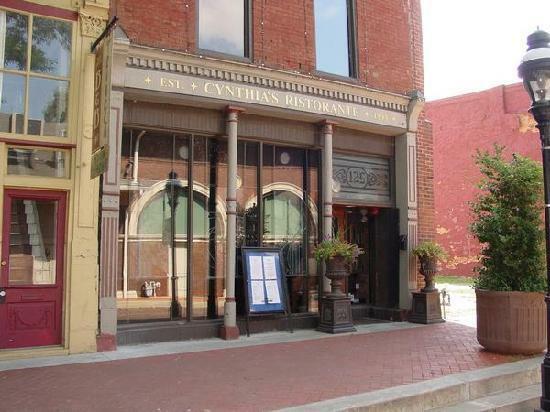 Cynthia's Ristorante is a long time Paducah favorite. Run by Bill and Cynthia Gardner in an 1850s building on Paducah's Market House Square, it features "California Italian," whatever that is. The ambience is classy, with white tablecloths, candles, light strings on the ceiling, etc. And the food lives up to its surroundings. The homemade bread, pasta, sauces and ice cream and the flown in fresh daily never frozen seafood give them an edge. The kitchen does some interesting things, like baking the Salmon in a paper bag to hold in moisture. We like their Bacon Wrapped Scallops, Scallops Over Lemon Risotto, Swordfish and Sea Bass. When they offer their Shrimp/Salmon/Crab/Pasta Casserole, someone at your table should order it. If you're not in the mood for seafood, their Chicken Manicotti, Pork Loin and Lamb Carpaccio are very good, although the lamb is flavored with a lively mustard sauce which many patrons love and others think is overpowering. Cynthia's has the finest and most extensive wine list in Paducah, although we do wish they would include Chileans. The menu changes according to what's available fresh. Most locals consider this the best restaurant in town so it tends to fill up on Friday and Saturday nights; if you're here then come early. 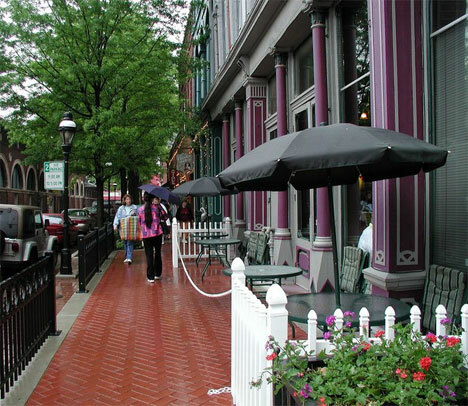 Di Fratelli's is as good a restaurant as you might find in any major city in Lexington or Louisville. Complete with a LeCordon Bleu chef and experienced kitchen crew, they produce a cutting edge 21st Century menu, consisting of a very few items very well done. Among the appetizers, we highly endorse their Eggplant Parmesan and Blue Chilean Mussels. They're widely known for their Apple Walnut Salad, but there are three others. There are five Pastas, of which our favorites are their Spaghetti and Meatballs (made with ground tenderloin, Italian sausage and prosciutto) and Fettucini Alfredo, but if you're into Marinara Sauce, they make one of the best in the state and serve it over a very good pasta. Several of our staff consider their Bowtie Carbonara (sauteed ham in a white cream sauce, finished with egg yolks and parmesan cheese, tossed with in house bowtie pasta) unique in the state. Where things get really interesting is on the Entree page. A house specialty is their Gorgonzola Horseradish Filet. It has been declared the finest filet in the Kentucky Lake region. That may be, but we think their Sea Bass Pizzaola (eight ounce filet seared, over balsamic rice, garlic, olives and peppers in white wine) is one of the best seafood entrees in an area with almost 100 restaurants serving seafood. Other entrees include Chicken or Veal Marsala, Pork Chop Saltimbocca (pork chop stuffed with prosciutto ham, sage and cheese, grilled, oven finished in white wine mushroom cream sauce, served with roast potatoes and grilled asparagus), Veal Chop, Filet Mignon, and Tuna or Veal Piccata. If you're into mixed drinks you might try their Lemon Drop Martini. Max's Brick Oven is two blocks up from the river on Old Market House Square. The building itself is a historical tour de force, sort of a museum of bits and pieces of former Paducah buildings. The doors, bannisters, windows, bricks, etc., each have their own story. However, the core of the restaurant is a handmade brick oven fired by red oak. This is not what you would expect in Paducah. The menu is very cosmopolitan, with smaller portions and emphasis on presentation. For starters, their French Onion Soup is made with sherry and quite unique, and Gyoza is lightly pan fried pot stickers in a really lively sauce, but our favorite appetizer is their Mediterranean Medley, a sampler of eggplant, hummus, olives, tomatoes and a bread basket. They're known for their four specialty steaks (Forestier, Peppercorn, Gaucho and Bistro) and Cuban Pork, but we think their best item is their Shepherd's Pie, a casserole of peas, carrots, lamb, beef, mashed potatoes and cheddar cheese. They serve nine very good Pastas (Shrimp, Spinach, Oriental, Jambalaya, Fisherman's, Linguini, Chicken Gorgonzola, Canneloni and Lasagna) and eight thin crust Pizzas which locals swear are the best in Paducah. Smoked Salmon Salad is supposed to be their best but we prefer the Pacific Rim, Greek and Mozzarella Alla Caprese. The wine list is extensive. 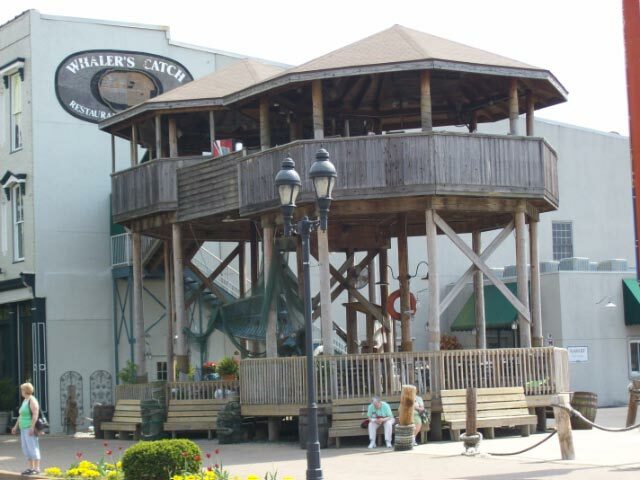 Whaler's Catch is in the historic district on the water front. 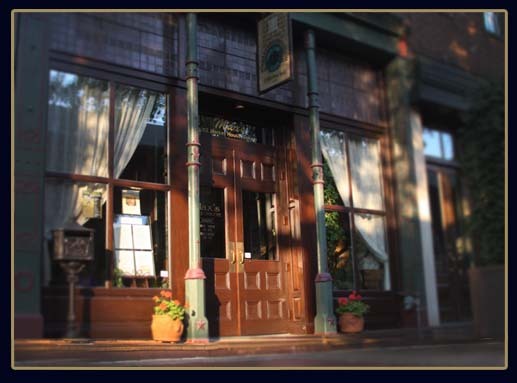 It's similar to a Red Lobster but no Red Lobster has an original 1863 hand carved 26 feet long mahogany bar which has hosted, among others, Ulysses S. Grant during the Civil War. On nice days you can sit outside in The Crow's Nest, an eccentric mix of Key Largo and the French Quarter (right) , and have the best seat in downtown Paducah. As for the menu, Whaler's is famous for its Mardi Gras Tea and Crab Cakes. However, we highly recommend you order the Maryland Crab Cakes, which are made from all Chesapeake Blue Crab, instead of the Whaler's version, which blends Gulf crab, whitefish and spices. They do a good job with their Grouper, Orange Roughy, Blackened Catfish, Oysters and Scallops (although they're smaller bay scallops, not the larger sea scallops as advertised). The Rolls and Hush Puppies are freshly made and good. Among appetizers you MUST order either the Alligator Tail or Frog Legs. The Shrimp Bisque is very delicate, which offends some who prefer a more robust flavor. Their Gumbo is a lot heartier. If you're here for lunch the Oyster Po Boy is a great Nawlins style sandwich and the Porpurri is a great sampler of red beans, rice, shrimp bisque, jambalaya and salad. Be sure to leave room for dessert; the Bread Pudding and Key Line Pie are both worth ordering.